Ace Indian fashion designer- Manish Malhotra is know for his bridal collection. Let’s take a look his best of the best latest creations! Whether or not you follow the fashion industry updates, it is unlikely that you have not have heard of Manish Malhotra. The designer that has styled almost all of Bollywood and that is a favorite among all the celebrities is a true legend in the fashion world. He is known for his beautiful ethnic wear designs that combine the best of traditional fashion with contemporary elements to create mesmerizing styles that every bride dreams of wearing. Manish Malhotra has styled the wedding outfits of many well known Bollywood celebrities. If you too want a Manish Malhotra look for your big day, there are many options that you can chose from his bridal collection that are perfect for the most beautiful wedding trousseau. Here are some of Manish Malhotra’s best bridal styles that you can choose from for your special day. 1. Golden girl: In this look, Manish Malhotra’s favorite muse, Kareena Kapoor, is decked up in a gorgeous gold and maroon lehenga. The blouse is short and the maroon skirt made with a glossy fabric extends all the way to the floor in a beautiful flare. What adds the element of glamour to this entire look is the gorgeous sheer and gold jacket that is attached to the blouse and flows till the bottom of the lehenga skirt. The shimmery gold and the matte finish gold flowers create the perfect combination of a sophisticated and rich style. 2. Royal elegance: In this style endorsed by Deepika Padukone, every inch of the outfit screams elegant royalty. 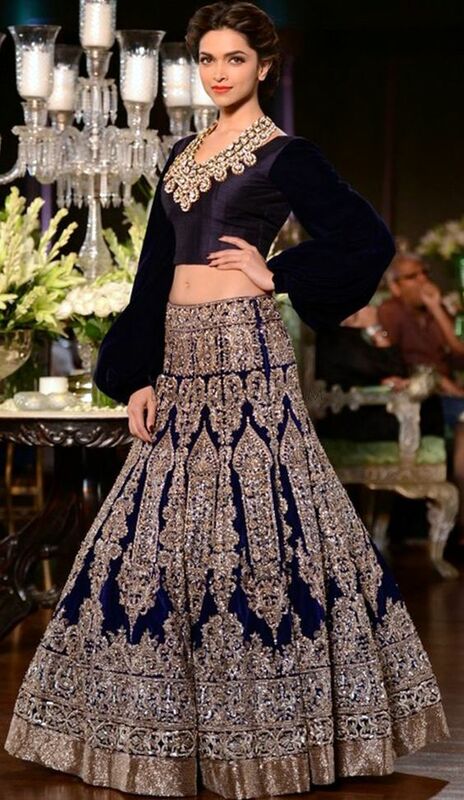 The deep blue blouse with the puffed sleeves creates the illusion of a Victorian era while the embroidery on the lehenga skirt, done in gold shows off a beautiful symmetry. The skirt is fitted at the waist and begins to flare from the mid-thigh, which flatters the figure while accentuating the height. The color of this lehenga is what makes the entire outfit stand out. 3. Mirrored pink: For the simplistic bride who loves her minimalist style, this gorgeous pink lehenga with mirror work will be a dream come true. The soft color of the lehenga teamed with the delicate mirror work shows off a simple sensibility, while the sheer dupatta with appliqué work adds the element of fun and vivaciousness to the whole look. 4. Traditional grace: If you are a more traditional bride, then you may want to opt for the tried and tested wedding colors such as red and gold. 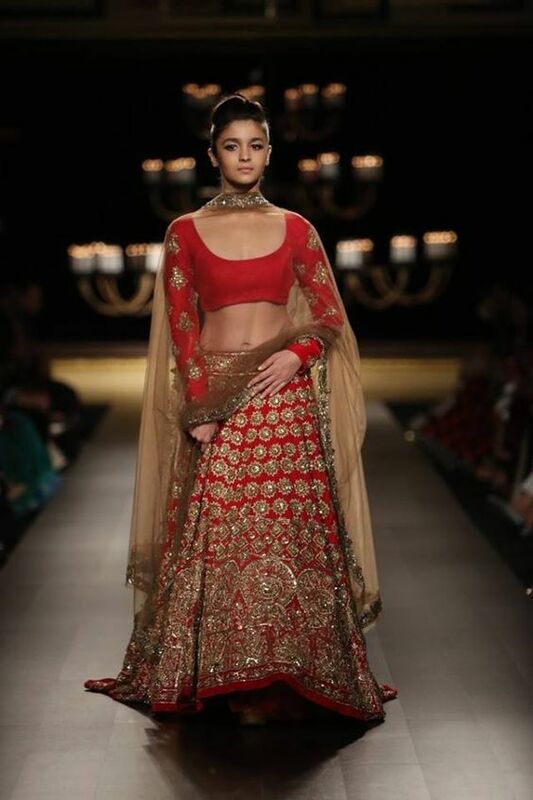 This lehenga is a unique take on the classic bridal outfit of a red saree or lehenga. The short top with a deep neck and long sleeves creates the perfect balance of modern spirit with traditional values. The lehenga skirt is a red base with gold embroidery, appliqué and sequins which add a refined quality to the entire outfit. Lastly, the sheer dupatta with a golden border makes sure that you can still show off your beautiful outfit while you tease your groom with a little bit of coverage. 5. Glitzy glamour: This look is perfect for the bride who loves her glitz and glamour. The outfit has an ivory base with shimmery sequins all over that are sure to add a sparkle to your festivities. The pink and red border at the bottom of the lehenga skirt perfectly breaks the monotony of the single color and adds an exciting spark to the entire look.